Talaria, a company that was building a “new, dynamic web application server with a JIT-based runtime at its heart,” just announced that it has been acquired by Google. The Talaria team will become part of the Google Cloud Platform team. For the most part, the Palo Alto-based company was flying under the radar until now. The company was co-founded by Austin Robison in 2011 and was apparently still in private beta when Google acquired it. 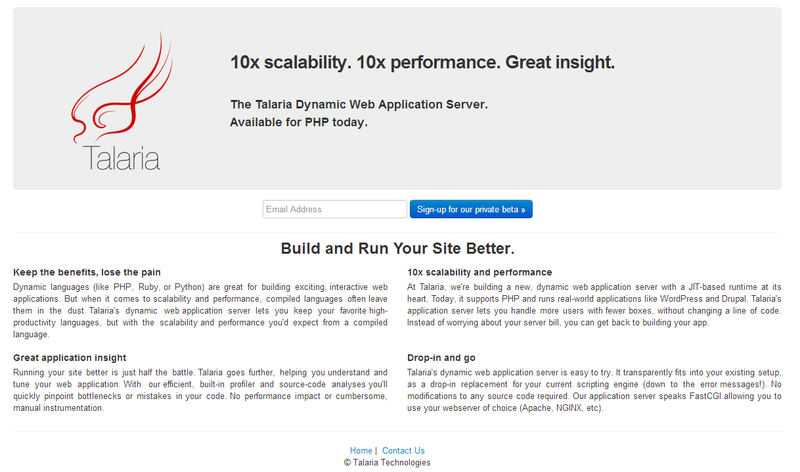 At Talaria, we set out to fix the way people build and run modern web sites and applications. Over the past two years, we’ve proven our technology by powering some of the most popular sites on the web. Now, by joining forces with Google’s Cloud Platform team, we’ll be able to help even more developers build and run their sites better. We’d like to thank those people that helped us get here. Our investors and advisors that stood behind us, both in good times and bad. Our beta customers that pushed us, kicked the tires, and warmly invited us into their organizations. And finally, our friends and family that have gotten less attention and time than they deserve while we’ve been busy. We’re excited about what we’ll deliver together with the Google Cloud Platform.